Provide Your Input on 2019 Regional Plan! We want to hear from you! The San Diego Association of Governments (SANDAG) is developing San Diego Forward: The 2019-2050 Regional Plan (2019 Regional Plan), which will provide a big-picture vision for our region over the next 30 years, and we want your input! The 2019 Regional Plan will provide a comprehensive path forward for the future of our region, forecasting various components such as population, where people will live, and where they will work. The plan will consider land use, transportation, open space, technology, and greenhouse gas reduction strategies to craft the overarching vision for the future. Your input is a vital part of the development process, as the 2019 Regional Plan intends to address the needs of diverse communities and constituencies throughout San Diego County. 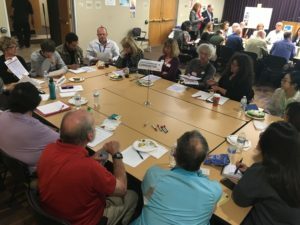 In spring 2018, SANDAG received valuable community input about transportation and quality of life priorities. Several priorities w ere identified, such as congestion relief, climate change and the environment, emerging technologies, healthy communities, and housing, jobs, and the economy. These were used to develop transportation network concepts for the 2019 Regional Plan, which are available for review and comment throughout October at SDForward.com/networks. A network is a package of projects, services, programs, and technologies that address transportation needs by connecting people from where they live to where they want to go. Each concept includes transit, active transportation, and roadway projects. 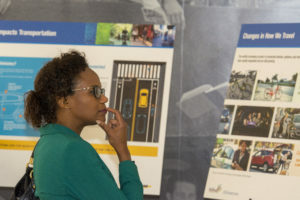 SANDAG is looking for your input on three network concepts – Shared Mobility, Connected Corridors, and Policy Possibilities – which emphasize different priorities, programs, projects, and policies. There are several opportunities to learn about the development of this comprehensive planning document. Participating in this process is simple, and one of the most effective and meaningful ways community members can help guide how our region evolves. Each outreach event will include an interactive review of the network concepts. One of the first opportunities to get involved is on Tuesday, October 16. SANDAG will host an open house to review the network concepts and give you a chance to speak with the project team and provide input. The open house will be hosted from 4 to 7 p.m. at San Diego City College. Check out the Facebook event page for more information and to RSVP. You also can attend one of five local community conversations to learn about the network concepts, ask questions, and provide input. Click on each event for more information and to RSVP. If you are unable to participate in person, you can take a quick, interactive online survey at SDForward.com/survey through October 31. Community members also are encouraged to subscribe to receive email updates about other opportunities to get involved in the development of the plan. A series of informational videos also is available to help you further explore the Regional Plan development process. Input received at these outreach events will be used to develop draft transportation network scenarios, which will be released for another round of public review and comment later this winter. Then, the SANDAG Board of Directors will select a preferred scenario, which will form the core of the 2019 Regional Plan. SANDAG values and encourages public input, and we are excited to hear what you would like to see in your future community. Spread the word and help us develop a plan that supports the economy, regional mobility, and improves our overall quality of life. Tell your friends and neighbors they can help shape our region’s future! 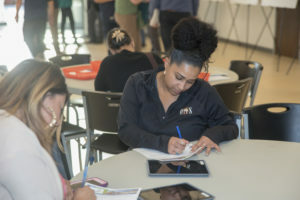 To learn more about the visions, goals, and policy objectives for the 2019 Regional Plan and how you can get involved, visit SDForward.com and sign up to receive email updates.